Starting in the 1970s, a national effort by our federal government was undertaken to GIVE police a better way to screen motorists suspected of drunk driving. Ironically, the origin of the concept of “scientifically-based” roadside testing came from two California psychologists. Marcelline Burns, who (in the early 1970s) was writing her Ph.D. thesis in psychology, in California, and was guided to this “idea” for her paper by Dr. Herb Moskowitz, her psychology thesis review professor. Burns’ thesis was sent to the federal government for consideration of the idea of creating such a “tool” for police officers to use pre-arrest divided attention tests and physical tests to decide which drivers were impaired, and (hopefully) make better arrest decisions. 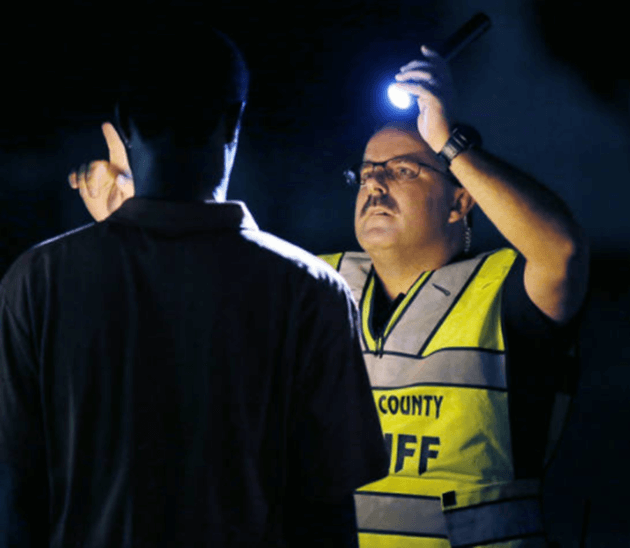 Because a post-arrest DWI-DUI refusal is very common, with up to 80% of drivers in some states refusing to be tested, the State may never get a breathalyzer reading or blood alcohol test, so that there is no prosecution for being over the legal limit. For skilled drunk driving lawyers, winning such cases was very easy. Regardless of how police came in contact with a suspected drinking driver, such as after a car accident, at a DUI checkpoint, or asleep behind the wheel, some type of pre-detention screening to help separate “drinking” drivers from drunken drivers was needed. Since any and all existing, rudimentary, unscientific efforts for local police departments to make up some type of pre-arrest screening procedures (e.g., blow into my hat, or throwing 3 coins on the ground and asking the person to pick up the coins in sequence, from lowest value to highest value), were useless, something was needed. The theory was that law enforcement officers could “generate” better “evidence” — based on the controlled research — to utilize to try to convince a jury that the driver had consumed too much alcohol to drive safely. Led by the National Highway Traffic Safety Administration (NHTSA), a division of the US Department of Transportation, the federal government gave the contract for development of such screening procedures to the person who suggested the NEED to have such roadside tests, Dr. Burns. The protocols for testing large groups of people in different studies was undertaken, with the first being reported out in 1977. Another one was released in 1981, since the false positives (people who were INCORRECTLY identified as having been “over the legal limit” based on the field sobriety test) was a staggering 47%, or about the same as flipping a coin! The 1981 study, also funded by NHTSA, and given to Burns and Moskowitz, focused on three field sobriety test exercises: the gaze nystagmus test, the walk and turn and the one leg stand. Another large group of test subjects, selected by Burns and her team, were put through multiple series of testing, and the dosing of these subjects created drunk drivers who were easier to spot, due to higher BAC levels or being given no alcohol at all. The claimed reliability increased, partially due to having subjects whose median age was lower, and the array having higher median BAC levels and more non-drinkers from before. 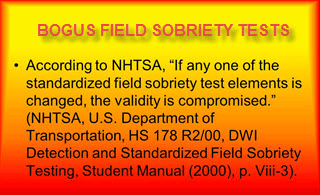 One more verification study was done in 1983, before the first NHTSA manual for “standardized” field sobriety tests was printed in 1984. 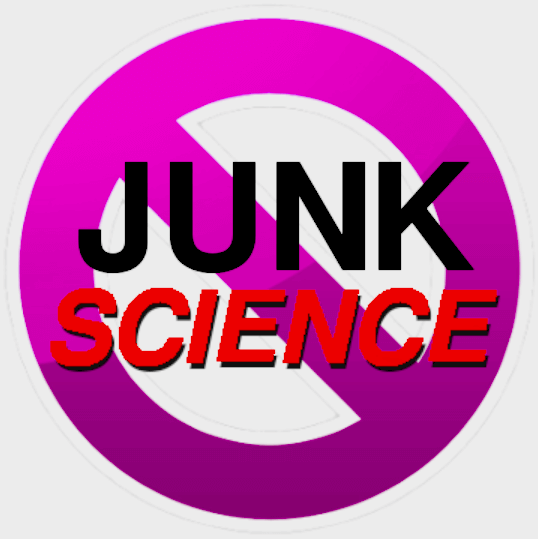 Significantly, not only was their full study and statistical findings NOT published, but ZERO effort by SCRI or NHTSA to obtain “peer review” (the benchmark for scientific reliability) was conducted on this claimed psycho-physical and divided attention “science.” In fact, the methods and data collection utilized by Burns and Moskowitz fell far short of compliance with “good science,” and any such review would have exposed the highly-expensive “manual” to claims of fraud and being “junk” science. The word “standardized” was included in the many manuals issued from 1984 to 2006, to provide an aura of “science” being behind the findings, but (after about 30 years of TEACHING that if not conducted in a standardized manner, that “the validity IS compromised”), NHTSA finally abandoned standardization entirely in its 2013 manual, by completely removing the standardization paragraph. Later, in 2015, another manual was “created” which CHANGED the wording, and the “standardization” by now saying “MAY BE compromised.” So, today’s police field sobriety training manual is NO LONGER requiring that officers DO THE TESTS in the PRECISE manner for which they were designed. This recent, unstated concession by the government agency to the LACK of officer compliance with performing field sobriety tests exactly as required by the training, renders the scientific reliability of the current roadside evaluations to be UNKNOWN. By removing the “standardized” language, the police-based tests no longer can be claimed to give predicted reliability of 77% (HGN test), 68% (Walk and Turn test) and 65% (One Leg Stand test). The “numbers” in the manuals were generated ONLY by officers who (under controlled circumstances and with trained scientific observers closely watching the procedures) GRADED the evaluations in the earlier controlled studies in 1977, 1981 and 1983. The best criminal defense attorneys (who have obtained advanced training in field sobriety tests as practitioners or instructors), were regularly winning their DUI trials, when they pointed out to jurors the precise language used in the manual. Here is the source of that admonishment and the wording. With expert testimony from the criminal defense attorney Atlanta to guide them, the jurors (in the Georgia DUI less safe cases, based upon alcohol intoxication) could see that that the NHTSA manual paragraph on standardization meant that the officer screwed up one or more field tests. This means a trial victory or at least a “hung jury” in most cases, either of which exonerates the person of the DUI less safe Georgia count. When you are interviewing drunk driving attorneys, quiz each lawyer for DUI about any specific trials (how many) and details of how to fight a case like yours. Locating a DUI Lawyer Atlanta is not difficult, but determining the best DUI Attorney is more difficult. 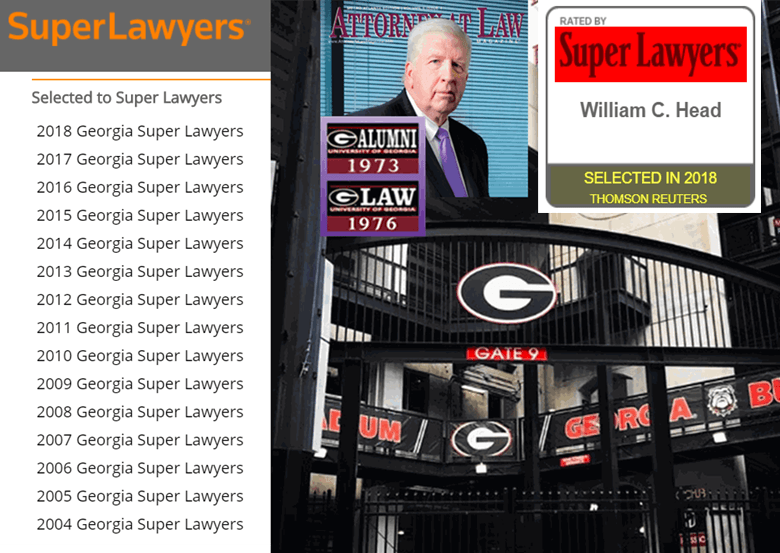 Start with credentials, then compare lawyer ratings, from attorney reviews by clients, and then looking at the recommendations by OTHER lawyers, for your potential driving under the influence lawyer. Our DUI law firm, with 3 partners — Larry Kohn, Cory Yager and William C. “Bubba” Head, has three highly-rated drunk driving attorneys, with impeccable credentials. Mr. Head is one of only 4 Georgia DUI lawyers who is Board-Certified, and has amassed more recognitions and awards than any other lawyer for DUI in Georgia. Here is the best part: FREE legal advice, and a FREE in-person lawyer consultation. Our criminal attorneys can also talk with you by phone, Facetime or other tele-conferencing method. Our criminal defense attorneys make your appointment FREE, so that you do not worry about DUI lawyer cost when you are trying to evaluate DUI specialists. Call 404-567-5515, to talk to a lawyer, 24 hours a day. What do you have to lose?